Walking Upright. Results of the 13th International Senckenberg Conference at the Werner Reimers Foundation Bad Homburg v. d. H. and at the Senckenberg Research Institute, Frankfurt am Main, October 5-9, 1999. Ed. : Franzen, Jens Lorenz; Köhler, Meike; Moyà-Solà, Salvador. 2003. (Courier Forschungsinstitut Senckenberg, Band 243). Abstract: The volume contains the main results of the 13th International Senckenberg Conference which took place October 1999 at the Werner Reimers Foundation at Bad Homburg v.d.H. and at the Senckenberg Institute at Frankfurt a.M. Topics are biomechanics of upright walking as well as constructional and functional analyses of recent and fossil primates relevant in this context. Special emphasis is put on the evolutionary and functional role forelimbs played with respect to the evolution of upright walking. This is an often neglected aspect, particularly with regard to the question: was it pronogrady or orthogrady or what else from which bipedality developed? Particular attention is paid to the analysis of fossils, above all the skeleton of the 3.3 my old Australopithecus from Sterkfontein as well as the foot prints from Laetoli, Tanzania. A chapter of its own is devoted to the still enigmatic ape Oreopithecus that lived and walked obviously upright bipedally about 8 million years ago on Islands in the Tyrrhenian sea. This case of a natural experiment may show to what extent similar but not identical preconditions result in similar although not identical constructional and functional evolutionary developments. The volume closes with a short summary and discussion of the constructional approach for reconstructing the evolution of human bipedal gait. From pronogrady or from orthogrady to bipedality? 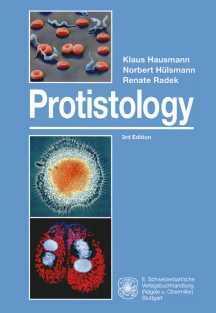 Protistology. Hausmann, Klaus; Hülsmann, Norbert; Radek, Renate. 2003. 3. edition. Animal Cytogenetics. Edited by Bernard John. Ed. Board: Hiroshi Kayano, Albert Levan. Flies of the Nearctic Region. Edited by Graham C.D. Griffiths. 24x17 cm. Volume V: Homeodactyla and Asilomorpha, Part 13: Hall, Jack C. and Evenhuis, Neal L.: Bombyliidae. Volume VI: Orthogenya, Part 6: Hurley, R.L. : Dolichopodidae: Hydrophorinae. Zoologica. editors: W. Funke und Friedrich Schaller. ISSN: 0044-5088 inquire about other volumes not listed! Volume 149. Bergleiter, Stefan. Zur Oekologischen Struktur einer zentramazonischen Fischzoenose Ethologische und Morphologische Befunde zur Ressourceteilung. ISBN 3-510-55036-6 Due 1999. Zoologie von Timor. C.B. Haniel.